Hi everyone, I hope that this finds you all well and happy. Last month I started a new feature, Reader Request. Where you, my lovely readers, could write in and let me know what kind of printable you wanted. Once a month, or more often if I get enough requests, I’ll make a printable that one of you has asked for, and share it here on the blog. Last month, I made up a Room by Room cleaning checklist. It’s been a huge hit. This month, I’ve got something a little different up my sleeve. This month’s request came to me from a friend’s niece She started high school this year, and is feeling a little overwhelmed with some of the larger school projects being assigned for homework. Because she is involved in a number of after school activities she is really trying to plan out her study time so she’s able to stay on top of school work, as well as continue to meet her other commitments. Currently, she uses her school issued planner to try to keep track of everything, but that means flipping back and forth between the weeks, and for her it just wasn’t working. She told me she was looking for something that would allow her to keep track of the important info for each assignment, as well as a place to break it down into smaller chunks. This teen is pretty big on goal setting, one of the MUST haves for her, was a space to allow her to set her own deadlines for each step. How could I possibly say no? After much back and forth, and a little tweaking here and there, this is what we came up with! I kept it pretty simple. There’s space for what class, what teacher, date assigned, date due, and how many marks it’s worth. Having the assigned date was really important to my friend’s niece. It allows her to see, at a glance, how long she has to complete it, as well as being able to see how long has already passed. There’s a box for keeping track of criteria, this is for any notes on teacher expectations. The idea is that this sheet will hold all the important info and can be kept at home. And the last section is a simple checklist area for breaking a project down into smaller, more manageable chunks. This section will enable a student to schedule these tasks so that large projects are not so overwhelming. And I’m still taking requests for more printables, the more the merrier! If you’ve been looking for just the right thing, or heck, maybe you don’t want to spend hours scouring the web looking for the right thing, just drop me a line and I’ll see what I can do! Can you believe there are only five more days til Christmas? Do you ever feel like Christmas starts off taking forever to get here and then all of a sudden, BAM! it’s so close you wonder where the time went? Are you all ready for the holiday? I love how you put together all these wonderful organized sheets that are colorful and hit the mark when it comes to organizing the “stuff” that gets lost and forgotten. 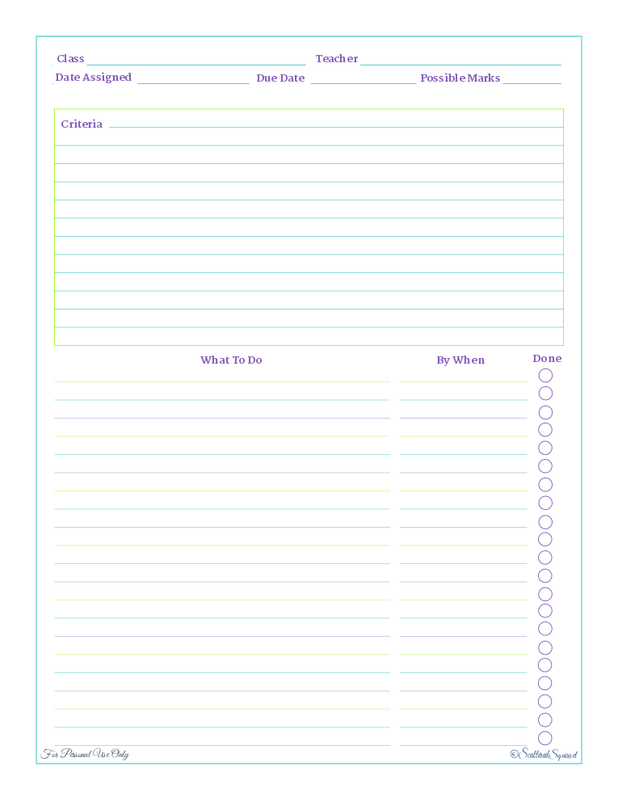 It would be great if you could make the kids daily reading logs into half pages for adults. I would like to keep closer track on my reading books and Bible, but not so detailed – just shoing what I have accomplished and where I left off. Thank you for all you do! God Bless your efforts. Thanks so much Susan. I’ll add in your idea for an adult book journal to my reader request list. I think that would be fantastic.